Aims and Objectives: The purpose of this study was to compare the efficacy of 5.25% sodium hypochlorite, 2% chlorehexidine and MTAD in disinfecting gutta-percha cones and to analyze the surface topography of gutta-percha cones after the rapid chemical disinfection procedure. Materials and Methods: Gutta-percha cones were immersed in suspensions of Enterococcus faecalis and Staphylococcus aureus separately. The cones were then immersed in 5.25% NaOCl, 2% CHX and MTAD for 30 seconds, 1 minute and 5 minutes separately. The disinfected cones were then incubated in thioglycollate media for 7 days. The thioglycolate media was sub-cultured and colony forming units were counted. For topographical examination of gutta-percha cones, the cones were immersed in respective solutions for one minute and allowed to air dry for 30 minutes after rinsing or without rinsing the cones with distilled water. The topography of the cones were then analyzed under SEM. Data was statistically analyzed using one way anova. Results: MTAD was found to be the most effective disinfecting solution. The topographical examination of GP cones found some deposits after the disinfection procedure in every group. These deposits were removed when the GP cones were rinsed with distilled water. Conclusions: MTAD possesses superior bactericidal activity when compared with NaOCl and CHX and a final rinse with distilled water is essential after the disinfection procedure. It is occasionally seen that even in endodontic procedures performed with utmost care, reinfection may occur. One possible explanation for this may be the use of contaminated gutta-percha cones in the root canals. Studies have revealed the presence of microorganisms in freshly opened boxes. , Even though the number of these organisms was quite low at the time of packaging, clinical usage increased the number of microorganisms contaminating the gutta-percha cones. , According to various studies, Staphylococcus genus is found to be the most common microorganism contaminating gutta-percha cones in their boxes and after handling with gloves. , According to Guimarães et al, the recovery rate of Staphylococcus genus from infected root canal is about 15.7%; this result justifies the need of gutta-percha disinfection. Enterococcus faecalis is another organism that is found to be the most resistant intra-canal pathogen in failed root canals that serves as a gold standard bacterium in endodontic research. Due to its superior virulence, it was selected in this study to represent the other possible organisms that may get contaminated with gutta-percha cones. However due to the thermoplastic nature of gutta-percha, the conventional methods of moist or dry heat sterilization cannot be used. A rapid chair side chemical disinfection is indicated. A 5.25% sodium hypochlorite solution is a broad spectrum antimicrobial agent and it is recognized as efficient, inexpensive and reliable. Chlorhexidine gluconate is a broad spectrum antimicrobial agent with substantively and relatively low toxicity. MTAD, a mixture of doxycycline, citric acid and tween-80 has been introduced by Torabinejad et al., as a final irrigant for disinfection of the root canal system. During gutta-percha disinfection, sodium hypochlorite and MTAD have been found to leave some deposits on the surface of gutta-percha cones. It is advisable to remove these layers or crystals before using the cones for obturation of root canals, since they may compromise the obturation seal. Therefore this study was undertaken to compare the efficacy of 5.25% sodium hypochlorite, 2% chlorhexidine and MTAD in disinfecting gutta-percha cones and to analyze the surface topography of gutta-percha cones after the rapid chemical disinfection procedure. In all, 280 gutta-percha cones (Size 80, Dentsply) were taken from freshly opened boxes and arranged in 8 groups. Groups I, II, III, IV and V were used to evaluate the efficacy of the disinfecting solutions. Groups I, II and III were further divided into a, b and c according to the disinfecting time. Ten contaminated gutta-percha cones immersed in 5.25% sodium hypochlorite for 30 seconds (Group I a), 1 minute (Group I b) and 5 minutes (Group I b), respectively. Ten contaminated gutta-percha cones immersed in 2% chlorhexidine for 30 seconds (Group II a), 1 minute (Group II b) and 5 minutes (Group II c), respectively. Ten contaminated gutta-percha cones immersed in MTAD for 30 seconds (Group III a), 1 minute (Group III b) and 5 minutes (Group III c), respectively. Ten gutta-percha cones contaminated with E. faecalis/S. aureus cultivated in thioglycollate media as a positive control. Ten gutta-percha cones from freshly opened boxes and individually cultivated in thioglycollate media as a negative control. Gutta-percha cones from groups VI, VII and VIII were used to check the topography of gutta-percha cones after the disinfection procedure. Groups VI and VII were subdivided to a, b, c according to the disinfecting solutions used. Ten gutta-percha cones were immersed in 5.25% sodium hypochlorite (Group VIa), 2% chlorhexidine (Group VI b) or MTAD (Group VI c) for 1 minute and dried for 30 minutes without rinsing in distilled water. Ten gutta-percha cones were immersed in 5.25% sodium hypochlorite (Group VII a), 2% chlorhexidine (Group VII b) or MTAD (Group VII c) for 1 minute and dried for 30 minutes after rinsing in distilled water with a gentle agitation. Ten gutta-percha cones were directly taken from the box and examined under scanning electron microscope. Microbial suspension of E. faecalis (ATCC29212) and S. aureus (ATCC6538) of approximately 10 8 CFU/ml in trypticase soy broth (HiMedia Laboratories) was used for this study. Gutta-percha cones from Groups I, II, III and IV were immersed in 20 ml of either of the above microbial suspensions for 30 minutes. The cones were then transferred to sterile paper pads and allowed to air dry for 10 minutes. After artificial contamination, 10 gutta-percha cones from Groups I, II and III were arranged on a stainless steel mesh separately and immersed in the respective disinfectant solutions contained in a petridish for 30 seconds, 1 minute and 5 minutes separately. The cones were then individually transferred to sterile test tubes containing 10 ml of thioglycollate media (HiMedia Laboratories) and incubated at 37°C for 7 days. After 7 days, a micropipette (Precica) was used to transfer the thioglycollate media to a petridish containing brain heart infusion agar and a sterile cotton tip was used to spread the thioglycollate media in a thin layer over BHI agar. The plates were then incubated for 48 hours aerobically at 37°C and the colony forming units were counted with a digital colony counter (Labmate). Scanning electron microscope (FEI Quanta 200 ESEM FEG) at 1000× magnification was used for the topographical examination of gutta-percha cones. Gutta-percha cones from Groups VI and VII were subjected to topographical examination after immersing in 5.25% sodium hypochlorite, 2% chlorhexidine and MTAD for 1 minute. In Group VI, the gutta-percha cones were arranged in the stainless steel mesh and immersed in the respective disinfecting solutions for 1 minute. The cones were then transferred to sterile paper pads and allowed to air dry for 30 minutes without rinsing the cones in distilled water. In Group VII, the gutta-percha cones were arranged in the stainless steel mesh and immersed in the respective disinfecting solutions for 1 minute. The cones were then individually rinsed with 10 ml of distilled water in a petridish with a gentle agitation. The cones were then transferred to sterile paper pads and allowed to air dry for 30 minutes. The topography of cones was then analyzed under scanning electron microscope at 1000× magnification. The data were analyzed by one-way ANOVA (analysis of variance) using SPSS 17.0 software. The mean bacterial count of E. faecalis or S. aureus was found to be lesser after treating the cones with MTAD when compared with other disinfecting solutions for all time intervals tested. 5.25% NaOCl was found to be the second most effective disinfecting solution while 2% CHX was the least effective among the solutions tested [Table 1]. Topographical examination of gutta-percha cones revealed the presence of some residues over the cones after the disinfection process. The deposits were removed after rinsing the cones with distilled water [Figure 1]. Earlier studies by Senia et al showed that 1-minute immersion of gutta-percha cones in 5.25% NaOCl eliminated microorganisms, whereas CHX was efficient only at 5 minutes. ,, The minimum contact time required for MTAD to eliminate the microorganisms is unknown. Therefore, immersion time intervals of 30 seconds, 1 minute and 5 minutes were selected for this study. In the current study, the mean bacterial count of E. faecalis or S. aureus was found to be lesser after treating the cones with MTAD when compared with other disinfecting solutions in all time intervals tested. This may be due to the synergistic effect of an antibiotic, acid and a detergent, which increases its bactericidal activity. The results of the current study were not in concurrence with the results of Senia et al who found that 1-minute immersion in 5.25% NaOCl was sufficient for the disinfection of gutta-percha cones. 5.25% NaOCl and 2% CHX completely eliminated S. aureus only in 5 minutes and they were unable to completely eliminate E. faecalis even after 5 minutes. The current study was in concurrence with Giardino et al., and Davis et al., who demonstrated that, 5.25% of NaOCl showed high antibacterial activity against anaerobic bacteria but was ineffective in eliminating facultative anaerobic bacteria. , According to their study MTAD was equally effective against anaerobic bacteria and facultative anaerobic bacteria. The test organisms used in the current study were facultative anaerobic bacteria. This may be the reason why 5.25% of NaOCl was less effective in eliminating microorganisms in the current study. The topographical examination of gutta-percha cones found some deposits after 1-minute disinfection procedure with all disinfecting solutions used. MTAD and CHX were found to leave lesser deposits compared to NaOCl. These deposits were removed when the gutta-percha cones were rinsed in distilled water with gentle agitation after the disinfection procedure. Within the limitations of this study, MTAD was found to be the most efficient disinfecting agent followed by 5.25% of NaOCl in eliminating E. faecalis and S. aureus at different time intervals tested. A 5-minute immersion is required for the complete disinfection and a final rinse of gutta-percha cones with distilled water is essential to eliminate the surface deposits. Kayaoglu G, Gürel M, Omürlü H, Bek ZG, Sadik B. Examination of gutta percha cones for microbial contamination during chemical use. J Appl Oral Sci 2009;17:244-7. Klager P, Dupont AA. The significance of environmental contamination of sealer and gutta-percha before endodontic obturation. Oral Surg Oral Med Oral Pathol 1987;63:606-9. Gomes BP, Vianna ME, Matsumoto CU, Rossi Vde P, Zaia AA, Ferraz CC, et al. Disinfection of gutta-percha cones with chlorhexidine and sodium hypochlorite. Oral Surg Oral Med Oral Pathol Oral Radiol Endod 2005;100:512-7. Gajan EB, Aghazadeh M, Abashov R, Salem Milani A, Moosavi Z. Microbial flora of root canals of pulpally-infected teeth: Enterococcus faecalis a prevalent species. J Dent Res Dent Clin Dent Prospects 2009;3:24-7. Short RD, Dorn SO, Kuttler S. The crystallization of sodium hypochlorite on gutta-percha cones after the rapid-sterilization technique: An SEM study. J Endod 2003;29:670-3. Royal MJ, Williamson AE, Drake DR. Comparison of 5.25% sodium hypochlorite, MTAD, and 2% chlorhexidine in the rapid disinfection of polycaprolactone-based root canal filling material. J Endod 2007;33:42-4.
da Motta PG, de Figueiredo CB, Maltos SM, Nicoli JR, Ribeiro Sobrinho AP, Maltos KL, et al. Efficacy of chemical sterilization and storage conditions of gutta-percha cones. Int Endod J 2001;34:435-9. Mahmoud YT, Al-Sabawi NA, Shehab EY. Rapid decontamination of gutta percha cones using different chemical agents. Al-Rafidain Dent J 2010;10:30-7. Pang NS, Jung IY, Bae KS, Baek SH, Lee WC, Kum KY. 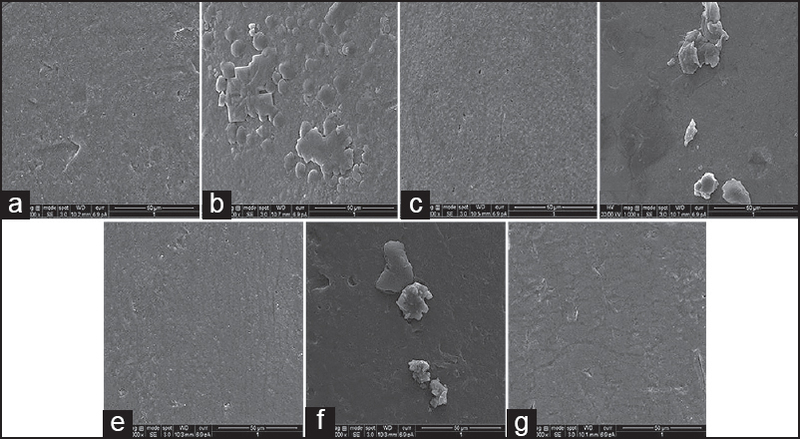 Effects of short-term chemical disinfection of gutta-percha cones: Identification of affected microbes and alterations in surface texture and physical properties. J Endod 2007;33:594-8. Goldberg F, Massone EJ, Pruskin E, Zmener O. SEM study of surface architecture of guttapercha cones. Endod Dent Traumatol 1991;7:15-8. Senia ES, Marraro RV, Mitchell JL, Lewis AG, Thomas L. Rapid sterilization of gutta-percha cones with 5.25 'o sodium hypochlorite. J Endod 1975;1:136-40. Davis JM, Maki J, Bahcall JK. An in vitro comparison of the antimicrobial effects of various endodontic medicaments on enterococcus faecalis. J Endod 2007;33:567-9. Giardino L, Savoldi E, Ambu E, Rimondini R, Palezona A, Debbia EA. Antimicrobial effect of MTAD, Tetraclean, Cloreximid, and sodium hypochlorite on three common endodontic pathogens. Indian J Dent Res 2009;20:391. Demiryürek EO, Onuk EE, Yüksel G, Çiftçi A. Evaluation of microbial contamination of resilon and gutta-percha cones and their antimicrobial activities. Afr J Microbiol Res 2012;6:6275-80. Retamozo B, Shabahang S, Johnson N, Aprecio RM, Torabinejad M. Minimum contact time and concentration of sodium hypochlorite required to eliminate enterococcus faecalis. J Endod 2010;36:520-3. Vianna ME, Gomes BP, Berber VB, Zaia AA, Ferraz CC, de Souza-Filho FJ. In vitro evaluation of the antimicrobial activity of chlorhexidine and sodium hypochlorite. Oral Surg Oral Med Oral Pathol Oral Radiol Endod 2004;97:79-84. Prado M, Gusman H, Gomes BP, Simão RA. The importance of final rinse after disinfection of gutta-percha and Resilon cone. Oral Surg Oral Med Oral Pathol Oral Radiol Endod 2011;111:e21-4. de Lima Guimarães, Soares NL, Otoch, Machado H, de Andrade, Cavalcante L. Microbiological evaluation of infected root canals and their correlation with pain. Rev Sul-Bras de Odontol 2012;9:31.